Cabbage isn’t just for coleslaw, stir-fry and sauerkraut. 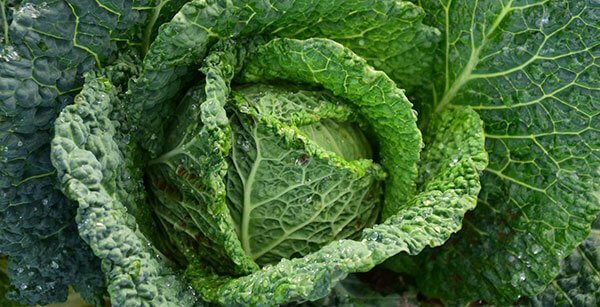 Did you know the leaf of the cabbage has powerful anti-inflammatory compounds that provide a remarkably effective treatment for relieving swelling, bruising, simple strain and pain associated with a wonky knee, twisted ankle and painful joints. You can use any kind of cabbage such as savoy or green cabbage. Peel away an outer cabbage leaves, wash thoroughly then pat dry with kitchen roll. Use a knife to cut out the hard stem then place the cabbage leaves on the kitchen work surface. Using a rolling pin or a milk/wine bottle, gently bruise the leaves to release the natural juices and they are floppy enough to easily mould to the body. 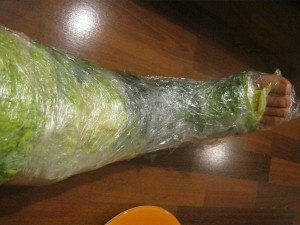 Place the cabbage leaves directly over the affected joint or area, cover with a bandage, cling film or tin foil and elevate if at all possible. Cabbage leaves can create great warm or cold compresses. For a cold compress, refrigerate the cabbage before you begin the process above. For a warm compress, microwave aleaf for 15-30 seconds. You can then skip the rolling pin step, as the heat will bring out the juices of the cabbage. Yup, for mastitis … You don’t smell great but you really don’t care! Oh yes! It was 15 years ago and I still remember it well! The memory doesnt fade even after 30 years. Yep, used them when Calum was a newborn! It’s an old remedy. I’ve used it to ease the pain of arthritis in my feet. I was told it contains salicylic acid i.e. aspirin not sure if that is true but it works! You’re just copying my profile pic 😉 Alright so your cabbage is a BIT bigger!! Brilliant Sue 🙂 Very impressive cabbage you have there! Every breast feeding Mum on the planet has been using this. A leaf is the right shape. However, the cabbage in the picture would be for a lady with very large assets. I am definitely going to try this on my shoulder, thanks. Similar to comfrey?